Feel free to add your pictures from MACNA to this thread. I had a great opportunity to meet a lot of people, and had some great conversations. There was an ABSOLUTELY STUNNING diplay that dererves some special attention, and I've got a few more photos of that exhibit. It was proclaimed exhibit of the year, and it was truly deserving. These are the outdoor exhibit halls that you're no doubt heard of. Just across the bay from downtown Boston. Gorgeous. Last edited by mhurley; 09/12/2004 at 05:22 PM. I was having a great conversation with 1diverdown (Doug Thompson) in the Deltec booth, when David Saxby stopped by. I felt like I was on a European vacation. I asked for a photo, and as I was getting my camera out of the bag, people showed up out of nowhere and started taking pictures. Very nice folks to chat with. Some damn nice equipment too. Busy spot all day long. John Maier was very informative about cyclopeeze, and I even scored a bar of frozen CE for the 3-hour trip home. (lots of ice). The polpys on this coral shot out within SECONDS of him feeding the CE to the tank. Very good display. I will unofficially say that this was one the most crowded exhibit all day. It was in the non-profit/information related room, adjacent to the Reefcentral Table. 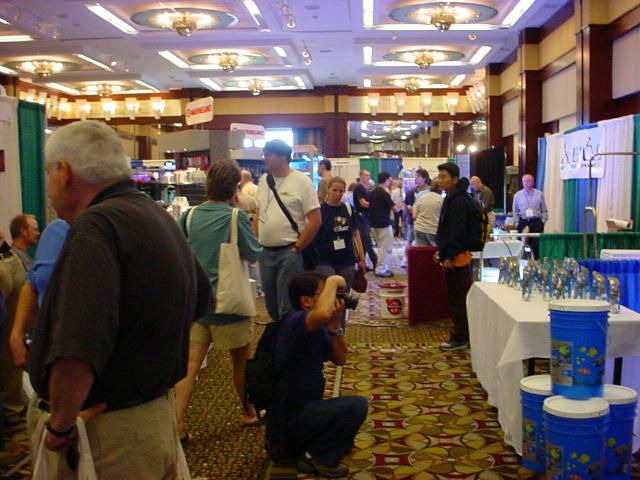 Several times a day, there were crowds of people around the Fregexchange.com table. They were giving out bottles of DTs and Seachem's reef dip all day long. But the main attraction was the fragging demonstrations. When they were finished with each demonstration, they gave frags out to the folks who were watching/learning. I met up with an excited couple earlier in the day who were VERY pleased about their free frag. Extremely informative sessions, and overall very well done. I was extremely impressed with the gang at www.fragexchange.com. Bubbleking skimmer at the captive oceans table. It feasted on some water from the Boston Harbor, and began to foam over quickly. They had to throttle it down quite a bit. Very cool skimmer. Imported on behalf of Royal Exclusiv. I hope we see more of these in the US soon. This is the heart of the bubbleking. Low power consumption and high output. That's what I like. This was part of the AGA display. This system was one of the raffle prizes. I was very glad to meet Andy (ASH on RC) from Icecap. We had an excellent conversation. For one reason or another, people often talk to me like I'm an idiot. (I'm young, and I look even younger...) But Andy took quite a bit of time to explain the new products coming on the US scene, and didn't dumb it down for me. The Japanese have them, and now we can expect them soon enough. The reflector on these bulbs is the exciting part. Sanjay tested them, and the results are awesome. Expect to see the results in advanced aquarist. This ain't no florex technology. One sassy pendant to house them in. Made with stainless steel and powdercoated aluminum. These are small, lightweight, attractive and not very hot. What-the? Is that a footlong 250w? Nope, the new 400w DE bulb. Get this, Icecap made a ballast that dims at the flick of a switch. It takes 2 minutes to ramp down. reverse the switch, it ramps up immediately. Sweet. Poor camera, but this is after the lamp returned to full brightness. Thanks for your time, Andy from icecap. Always a pleasure. Last edited by Ewan; 09/12/2004 at 10:47 AM. great info and pics andy, well done. Thanks for sharing. This won exhibit of the year. No mystery to me. Tis was the aquamedic display. 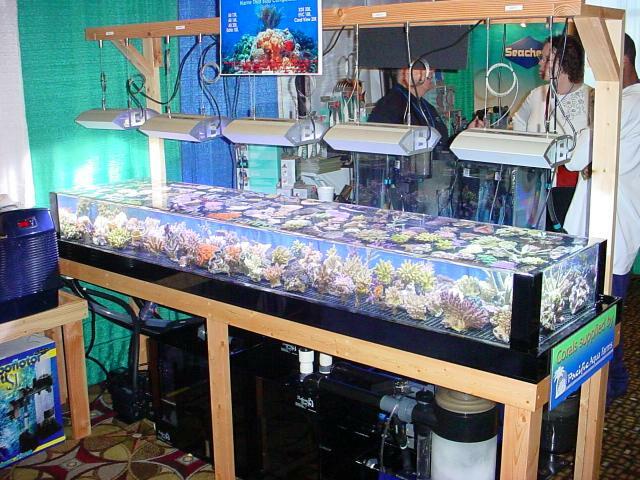 The real attention-getter was the system built by Reefcentral Sponser, Jeremy Redmond of redmondreef.com. Just before I left, I decided to hassle someone to find out who made this AWESOME tank. The guy I chose to hassle was Jeremy. He had quietly watched people ooo and awww about his creation all day long. Notice anything different? There's good flow in there, but the surface is perfectly flat. The sump and all filteration was also built by www.redmondreef.com The AB oceanlights were very actractive over this system. Here's what took me 3 trips to the booth to figure out: The water actually overflows over the sides of this tank, and there is a thin, uniform film of water flowing down the outside of the tank. This flows into a 'moat' that drains down to the sump. The bottom of the tank was fed by 2 large oceanrunner pumps, which kept enough water flowing down over the sides to give a nice uniform sheet of water. 5 out of 5 for acrylic work, presentation, and fooling most of Macna. I had to get my sleeve wet before figuring it out. And this is what you get when you take a picture looking up at the surface. Feel free to post your macna pics. Please, no gossip. I don't want this thread closed. I was really disapointed that i could not attend the conference because of work. Many thanks for sharing some of your pics. Yeah, thanks for the great pics. Those IceCap mini pendant pics were of particular interest as I ordered one of those last month and am just waiting for it to arrive. My pleasure. I didn't take nearly as many pictures as I wanted to. I engaged in many a conversation. I didn't have a chance to take pics of the RC gang. My drive left before the "Meet the RC mods and experts" started at 3:00. That was a shame. I did get to meet DGenR8, and JohnL. I also passed by BrianD. Funny, he didn't look so evil. You're not going to be disappointed. Trust me. I'm going to get one to acccent the clam plateau of my reef. Anyone else have any pictures to add? That is one sweet tank and a very unique approach for surface extraction. Thanks for posting those, Ewan! Another view of the Aquamedic tank. I gotta tell ya, I didn't like that guess-the-light contest though. After I left, I was really sorry that I didn't just ask which bulb was the 16K. I find the 20Ks too blue but might like a little more than the 13K. There I was with a chance to see the color in person, and I left without knowing which one it was. Argh! A couple of those teardrop clams. There are exceptions to rules, and those exceptions make that hobbyist a lucky person indeed. However, that doesn't mean instant success for everyone else. Those are some awesome pics. Thanks for sharing. Very nice! Keep em coming! I also passed by BrianD. Funny, he didn't look so evil. Awesome, nobody else bring a camera? I must say as a member of the www.fragexchange.com that I'd like to thank you for the very nice comments. We had a blast and enjoyed meeting everyone that we could. And the Reef Central gang was quite wonderful to us. He said you didn't look evil, but was probably afraid you really were! Yes, that was me buying all the acro etc from the aquamedic tank.